Work began on Barcelona's Sagrada Família (Temple of the Holy Family) in 1882, based on a design by Francisco de Paula Villar, who envisioned a simple church in a traditional neo-Gothic style. 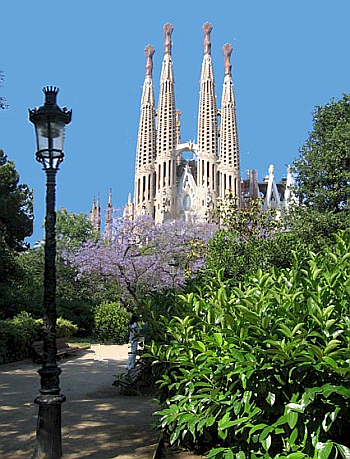 But after he resigned in 1883, Gaudi was appointed the lead architect and redesigned the church entirely. His imaginative plans included 18 spires and five naves, rich with decorated organic detailing. In 1911, the devout Catholic devoted himself entirely to the project, and spent the next 15 years living and working on site as a virtual recluse, supervising work. He died in 1926, after being run over by a tram. Since then different architects have continued the work after his original idea. It has always been an expiatory church, which means that since the outset, 125 years ago now, it has been built from donations. Gaudí himself said: "The expiatory church of La Sagrada Família is made by the people and is mirrored in them. It is a work that is in the hands of God and the will of the people." Although incomplete, the church is a UNESCO World Heritage Site visited by millions, and it will become the world's tallest church when the 170m (560ft) central tower is erected. In November 2010 the church was consecrated and proclaimed a minor basilica by Pope Benedict XVI.